I fear that my book may not have conveyed with adequate clarity my views about the economic crisis. The depiction of those views in Jeffrey Friedman’s review does not correspond to what I thought I was saying. He says that the “heart of Posner’s case against ‘capitalism’ is the…theory…[that] perverse incentives, created by banks’ executive-compensation systems, caused the crisis.” That is not my position at all. For one thing, I do not mount a “case against ‘capitalism.’” I believe in capitalism. I merely argued that capitalism is apt to run off the rails without (and here I am quoting from Friedman’s review) “active and intelligent government.” I attribute the financial collapse of last September that deepened a recession into something grave enough to warrant the name of “depression” to unsound monetary policy by the Federal Reserve and to excessive deregulation, coupled with lax regulation, of the financial services industry. Friedman I think agrees, at least about regulation (he doesn’t mention monetary policy at all), as when he remarks that banks’ leverage ratios are regulated by law and “this law, unmentioned by Posner, was probably the main cause of the crisis.” The decision by the SEC in 2004 to allow broker-dealers (Merrill Lynch, Goldman Sachs, Lehman Brothers, etc.—major components of the “shadow banking” system, which played a bigger role in the financial collapse than the commercial banks) to increase their leverage is an example of excessive deregulation, which was indeed, as I emphasize throughout the book, a main cause of the crisis. Friedman appears to agree that regulatory ineptitude created an environment in which rational self-interest drove bankers to take risks that were excessive from a macroeconomic standpoint. That and unsound monetary policy were the main causes of the crisis—as I argued, I thought clearly and indeed emphatically, in the book (as in my subsequent blogging on the crisis in my Atlantic blog, which is also called “A Failure of Capitalism”). I never said, by the way, as Friedman thinks I did, that the banks were “heedless of the risk” of risky lending. I said they took risks that seemed appropriate in the environment in which they found themselves. 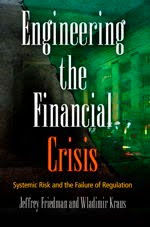 They probably were heedless of macroeconomic risk, but as I explain in the book it is not the business of private business to avoid actions that create external costs, such as the costs borne throughout the economy when the financial system collapses. The responsibility for controlling those costs are the government’s, and it was discharged poorly. I do think executive-compensation practices played a role in the crisis, and Friedman does me the courtesy of describing my theory of how the practices affected the behavior of banks “logical.” But he is incorrect to suggest that I think the practices “caused” the crisis. They were a causal factor, but not a principal one; the main ones, as I thought I had made clear in my book, were as noted above. He does make the good point that to test the theory would require correlating different banks’ compensation schemes with different banks’ losses; I don’t believe that that’s been done. He points out correctly that banks structured as partnerships would be more risk averse than banks that are structured as corporations (because of the limited liability of shareholders), but it is unrealistic to suppose that banks of the scale of the major modern banks could attract sufficient equity capital as partnerships—precisely because of the greater financial risk borne by a partner than by a shareholder. Friedman’s example of a financial company organized as a partnership—Brown Brothers Harriman—has partnership capital of only about $500 million. Goldman Sachs’s market capitalization of almost $100 billion is 200 times greater. But I agree that the tax laws are among the deep underlying causes of the economic crisis, in particular the deductibility of mortgage and home-equity interest (but not other interest) from personal income tax, which encourages risky investment in housing, and the favorable treatment by the tax code of debt versus equity, which encourages leverage. I do not dwell on these causes of the crisis in my book because they will not be changed. In contrast, improvements in monetary policy and in regulation are at least within the realm of the possible, though perhaps unlikely.